Our IFR Velour's are made with the finest quality IFR Yarn in the marketplace at the absolute best pricing. 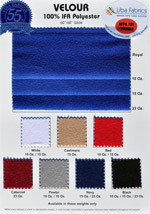 Ideal for draping, swagging, masking, panels, decoration etc. Made with the finest IFR yarns passing NFPA701 before and after washing. Beautiful face, hand, drape, wrinkle resistant and durable! 62" available in Black all weights and White in 10oz.